I just wanted to stop in and thank you for sharing your story about Chief Hawk Pope… a journey fueled by intuition for sure. When I was outside spading dirt around young trees in our Gratitude Grove yesterday, thoughts of my new (old heirloom) seeds for this year started crossing my mind. I’m a grower for a seed bank. The last 2 years I’ve been growing/walking with heirloom Cherokee seed Spirits – amazing!! When I felt that connection/grow-out was complete I looked in my heirloom corn book by Dianna Henry (Snow Eagle Seeds Sing) for what corn wanted to come to this land next. I was drawn to two corns, one of which I was given to grow this season. I was told that this old corn seed had low germination – only 40%. The name of these seed Beings is Tecumseh’s Flint Corn. I am so deeply connected to their energy and pray they choose to come up here even at 40%. I continued to dig in the earth as thoughts about Tecumseh’s seed increased; then I felt a real urge to get out my corn book and reread the history. When I did, I was tickled to re-member s/he is Shawnee. When I think of Tecumseh, I think of peace. Even though I do not know him, when I think of Chief Hawk Pope, I think of peace. …”Seven colors-yellow, white, deep red, rose, blue, light blue, orange. One Cob-All People-All People-One Light”. (‘Whispering Ancestors: The Wisdom of Corn’). This part (for me) made me think of the story threads of you and Chief Hawk Pope’s reconnection…? All this said, I support (confirm) your journey fueled by intuitive threads. Also, sending many prayers for safety for all and AZ fires to be extinguished. I’m in need of direction, guidance or maybe just spiritual advice. I am 36 years old and when I was 9 my family and I moved to Ohio from New Jersey. I began to feel something profound, something that has been with me since and something I have difficulty fully explaining in words. It’s very much more a feeling, an intuition all of a very deep spiritual basis. I truly feel as if my soul began it’s earthly journey in the body of a Native American. 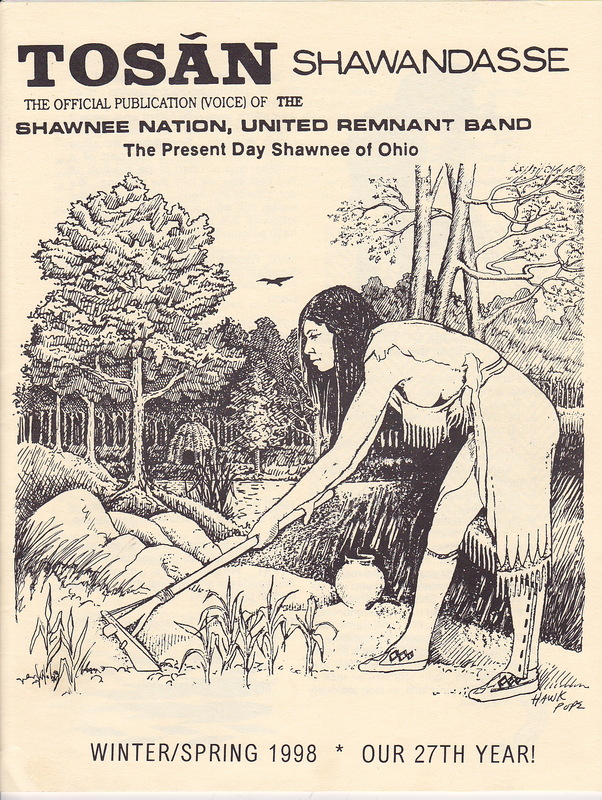 As years have gone by, it has developed into a knowing that I was once a part of the Shawnee Tribe, sept unknown as of yet. I can see Kokumthena and Rounded Side and more in the moon… I would truly, sincerely and greatly like to visit and speak with someone regarding this. I have had deer approach me while in the woods and felt it to be another sign. In particular, would very much like to council with a member of the Shawnee Nation United Remnant Band regarding this, not to waste another’s time, but because my life truly is on hold and is confusing everyday and I feel as if it may be a hurdle for the rest of this life. I realize no one can tell me anything for sure or point at me and say “yes, you are ” but if someone could know what has been happening throughout my life and the feelings I have had, maybe something positive could come of it. I realize every man is his own chief and can tell himself what to do and my inner chief told me I need to do this, which is why I am writing this. Thank you sincerely for listening. Kevin, you could call Zane Shawnee Caverns outside Bellefontaine, OH and ask to speak to a senior member. You can find that information by doing a search on the internet. Since Chief Hawk Pope’s passing in 2015 I don’t know what on Shawnee land is open to the public or who is available for counsel. All best in your quest. Thank you, sincerely, for your response. I will follow your suggestion and because you responded, will let you know the outcome. I left my heart on the ground upon hearing last year of the passing of Chief Tukemas.